Outside the City, the only considerable Byzantine possession was the Despotate of Morea, now known as the Peloponnese. Andronicus Palaeologus had given Thessalonica into the hands of the Venetians, who then, in 1430, lost it to the Turks. There, in the capital of Mystra, a last flourishing of Byzantine civilization took place… And yet it was a strange flourishing when Mystra’s most famous citizen, the philosopher George Gemistus Plethon, was a student of Aristotle, Zoroaster, and the Jewish Cabala, and who was discovered, after his death, to have been a believer in the pagan Greek gods! The Greek delegation consisted of 700 ecclesiastical and lay notables, including twenty metropolitans. The leader of the bishops was Patriarch Joseph II of Constantinople. He had previously told the Emperor: “The Church must go in front of the power of the Emperor, or next to it, but in no way behind it.” And yet he meekly followed the same Emperor to Florence and submitted to his instructions. Moreover, he was prepared to make critical concessions on the issue of the Filioque, agreeing with the Latins that the prepositions “proceeding through” and “proceeding from” meant the same. However, it was not only humanists or Greek nationalists that looked with hope towards the council in Florence. Paradoxically, even some of those who remained true Romans – that is, who valued the Universalist heritage of Christian Rome more than any specifically Hellenistic elements, and for whom the true glory of the empire was its Orthodoxy – were attracted by the prospect. In the minds of some, this was because the idea of imperial unity between East and West was inextricably linked with that of ecclesiastical unity. Thus many factors – obedience to the emperor, fear for the fate of Hellenism, hopes of a reunion of Christendom – combined to undermine the resistance of most Greeks to the unia, which involved surrender to almost all the pope’s demands, including the Filioque and papal supremacy. In July 1440 St. Mark wrote: “To All Orthodox Christians on the Mainland and in the Islands. “From Mark, Bishop of the Metropolis of Ephesus—Rejoice in Christ! “And so these split people, like the mythical centaurs, confess together with the Latins that the Holy Spirit proceeds from the Son, and has the Son as Cause of His existence, and yet together with us confess that He proceeds from the Father. And they say together with them that the addition to the Creed (of the Filioque) was done canonically and with blessing, and yet together with us do not permit it to be uttered. (Besides, who would turn away from what was canonical and blessed?). And they say together with them that unleavened bread is the Body of Christ, and yet together with us do not dare to accept it. Is this not sufficient to reveal their spirit, and how that it was not in a quest for the Truth—which, having in their hands, they betrayed—that they came together with the Latins, but rather from a desire to enrich themselves and to conclude not a true, but false, union? “The pious canons speak thus: ‘He is a heretic and subject to the canons against heretics who even slightly departs from the Orthodox Faith.’ If then, the Latins do not at all depart from the correct Faith, we have evidently cut them off unjustly. But if they have thoroughly departed [from the Faith]—and that in connection with the theology of the Holy Spirit, blasphemy against Whom is the greatest of all perils—then it is clear that they are heretics, and we have cut them off as heretics. “If the Latin dogma is true that the Holy Spirit proceeds also from the Son, then ours is false that states that the Holy Spirit proceeds from the Father—and this is precisely the reason for which we separated from them. And if ours is true, then without a doubt, theirs is false. What kind of middle ground can there be between two such judgments? There can be none, unless it were some kind of judgment suitable to both the one and the other, like a boot that fits both feet. And will this unite us?.. “And we say that neither do the Saints receive the kingdom and the unutterable blessings already prepared for them, nor are sinners already sent to hell, but both await their fate which will be received in the future age after the resurrection and judgement; while they, together with the Latins, desire immediately after death to receive according to their merits. And for those in an intermediate condition, who have died in repentance, they give a purgatorial fire (which is not identical with that of hell) so that, as they say, having purified their souls by it after death, they also together with the righteous will enjoy the kingdom; this is contained in their Conciliar Decree. “And we, obeying the Apostles who have prohibited it, shun Jewish unleavened bread; while they, in the same Act of Union, proclaim that what is used in the services of the Latins is the Body of Christ. “And we say that the addition to the Creed arose un-canonically and anti-canonically and contrary to the Fathers; while they affirm that it is canonical and blessed—to such an extent are they unaware how to conform to the Truth and to themselves! “And for us, the Pope is as one of the Patriarchs, and that alone—if he be Orthodox; while they, with great gravity, proclaim him ‘Vicar of Christ, Father and Teacher of all Christians’ May they be more fortunate than their Father, who is also like him. For he does not greatly prosper, having an anti-pope who is the cause of sufficient unpleasantness; and they are not happy to imitate him. “And so, brethren, flee from them and from communion with them, for they are false apostles, deceitful workers, transforming themselves into the Apostles of Christ. And no marvel, for Satan himself, is transformed into an angel of light. Therefore, it is no great thing if his ministers also be transformed as the ministers of righteousness, whose end shall be according to their works (II Corinthians 11:13–15). And in another place, the same Apostle says of them: ‘For they that are such serve not our Lord Jesus Christ, hut their own belly’; and by good words and fair speeches, they deceive the hearts of the simple. Nevertheless, the foundation of God stands sure, having this seal (Romans 16:18; II Timothy 2:19). And in another place: ‘Beware of dogs, beware of evil workers, beware of the circumcision’ (Philippians 3:2). And then, in another place: ‘But though we, or an angel from heaven, preach any other gospel unto you than that which we have preached unto you—let him be accursed’ (Galatians 1:8). See what has been prophetically foretold, that ‘though an angel from heaven,’ so that no one could cite in justification of himself an especially high position. And the beloved Disciple speaks thus: ‘If there come any unto you, and bring not this doctrine, receive him not into your house, and give him no greeting; for he that giveth him greeting is a partaker in his evil deeds’ (II John 10–11). ‘Therefore, in so far as this is what has been commanded you by the Holy Apostles, stand aright, hold firmly to the traditions which you have received, both written and by word of mouth, that you be not deprived of your firmness if you are led away by the delusions of the lawless. St. Mark’s confession had a good effect. In April 1443 when the three Patriarchs Joachim of Jerusalem, Philotheos of Alexandria, and Dorotheos of Antioch met in Jerusalem and condemned the Council of Florence as “vile” and Patriarch Metrophanes of Constantinople as a heretic. St. Mark, as Runciman writes, “was treated as a martyr by almost the whole body of the Greek Church. The Emperor soon found that it was easier to sign the union than to implement it. He remained personally loyal to it, but, influenced by his aged mother, he refrained from trying to force it on his people. He found it hard to persuade anyone to take the empty Patriarchal chair. Metrophanes II, whom he appointed in May 1440, died soon afterward. His successor, Gregory Mammas, who was a sincere advocate of union, found it prudent to retire to Italy in 1451. Bessarion [of Trebizond], liked and admired though he was personally, had already moved to Italy, shocked at the hostility that his actions had aroused at Constantinople and believing that he could best serve the Greek cause by remaining among the Italians. Isidore of Kiev’s adherence to the union was angrily repudiated by the Russian Prince, Church, and people, who deprived him of his see. He too went to Italy. The Eastern Patriarchs announced that they were not bound by anything that their representatives had signed and rejected the union. George Scholarius, though he had accepted the union and was devoted to the works of Thomas Aquinas, was soon convinced by Mark Eugenicus that he had been wrong. He retired into a monastery, and on Mark’s death in 1444 he emerged as leader of the anti-unionist party. The lesser clergy and the monks followed him almost to a man. 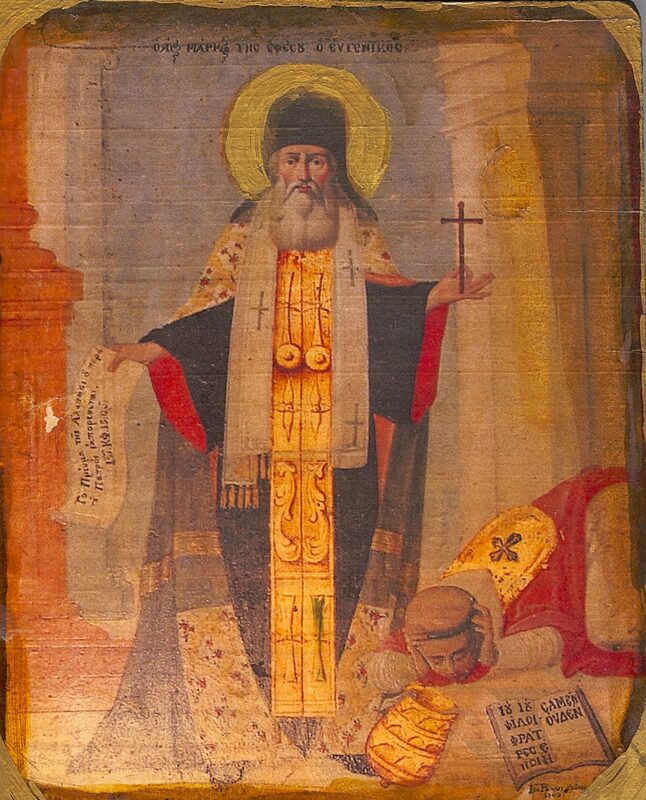 In 1434, on the death of Metropolitan Photius, Bishop Jonah of Ryazan was elected metropolitan of Kiev and sent to Constantinople for consecration. “But here,” writes Protopriest Peter Smirnov, “obstacles were encountered. The Greeks were going through their last years. The Turks had moved up to Constantinople from all sides. The only hope of salvation was seen to be help from the West, but that could be bought only by means of humiliation before the Roman pope. Negotiations concerning the union of the Churches were undertaken. On the Latin side, people were being prepared in the East who would be able to agree to union, and they were given influential places and posts. One of these people was a certain Isidore, a very talented and educated person, but one who from a moral point of view was not especially firm, and was capable of changing his convictions. It was he whom they hastened to appoint as metropolitan for Moscow before the arrival of Jonah in Constantinople. St. Jonah was promised the metropolitanate after Isidore. “Soon after Isidore had arrived in Moscow, he declared that the Eighth Ecumenical Council was being prepared in Italy for the union of the Churches and that it was necessary for him to be there. Then he began to prepare for the journey. Great Prince Basil Vasilievich tried in every way to dissuade Isidore from taking part in the council. Finally, he said to him: “If you unfailingly desire to go to the eighth council, bring us thence our ancient Orthodoxy, which we received from our ancestor Vladimir, and do not bring us anything new and foreign, which we will not accept.’ Isidore swore to stand for Orthodoxy, but at the council of Florence, he was especially zealous in promoting an outcome that was favourable for the pope. 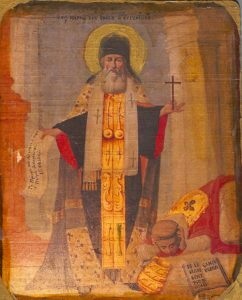 At the end of the council and after the reception of the unia, Isidore… returned to Moscow, and in his first service began to commemorate the pope instead of the Patriarch of Constantinople. The great prince publicly called him a Latin seducer and heretic and ordered that he be placed under guard until a conciliar resolution of the matter. The Russian bishops gathered in Moscow [in 1441] and condemned Isidore. Together with his disciple Gregory he fled to Tver, then Lithuania, and finally to Rome, where he remained for good with the pope. January 19 / February 1, 2018. Tuchman, A Distant Mirror: The Calamitous Fourteenth Century, New York: Knopf, 1978, p. 560. Montefiore, Titans of History, London: Quercus, 2012, p. 157. Wells, Sailing from Byzantium, New York: Bantam Deli, 2006, pp. 91-92. Runciman, The Great Church in Captivity, Cambridge University Press, 1968, pp. 103-104. A.P. Lebedev, Istoricheskie Ocherki Sostoiania Vizantijsko-Vostochnoj Tserkvi (Historical Sketches of the Condition of the Byzantine Eastern Church), St. Petersburg, 2003, p. 102. Hefele, Histoire des Conciles, vol. VII, pt. II, pp. 1015sq. Meyendorff, “Was there an Encounter between East and West at Florence?” in Rome, Constantinople, Moscow, Crestwood, N.Y.: St. Vladimir’s Seminary Press, 1996, p. 89. Meyendorff, op. cit., p. 90. John Sanidopoulos, “The Danger of ‘Mutant’ Theology”, http://www.johnsanidopoulos.com/2015/03/the-danger-of-mutant-theology.html?m=1. Ducas, in volume 6 p. 299 of the History of Paparrigopoulos. “In the eyes of Mark, even the complete political extinction of the Byzantine State was not as important as the preservation of the integrity of Orthodoxy” (Constantine Tsipanlis, Mark Eugenicus and the Council of Florence, New York: Kentron Vyzantinon Erevnon, 1986, p. 60). St. Mark, P.G. 160, cols. 536c and 537a. Runciman, op. cit., pp. 109-110, 159-160. Gennadius Scholarius, in Sir Edmund Gibbon, The Decline and Fall of the Roman Empire, ed. J. B. Bury, VII, 176. Smirnov, Istoria Khristianskoj Pravoslavnoj Tserkvi (A History of the Orthodox Christian Church), Moscow: Krutitskoe podvorye, 2000, pp. 159-160. Boyeikov, Tserkov’, Rus’ i Rim (The Church, Rus’ and Rome), Jordanville, N.Y.: Holy Trinity Monastery, 1983. See Fr. John Meyendorff, Byzantium and the Rise of Russia, Cambridge University Press, 1981. And yet at the same time that it acquired full independence, the Russian Church lost its unity: a separate metropolia for the Lithuanian State was established in Kiev in 1458 (N. Riasonovsky, A History of Russia, Oxford University Press, 2000, p. 121).